We stock a fantastic range of Fisher Price products including toys, bouncers, rockers, gyms, tummy time mats, mobiles, monitors, educational and activity toys, potties, highchairs and entertainers. Fisher Price products let your child learn while they play and have fun , the range of toys from Fisher Price lets parents encourage the development and activity of their baby while growing up. Sleek monitor designed to make it easy to stay in touch with baby. There are sound-activated lights on both sides of the receiver so it's easier to see baby's activity from wherever you might be in the house or yard. There's also a built-in nightlight on the transmitter to help you see better when you're peeking into the nursery. 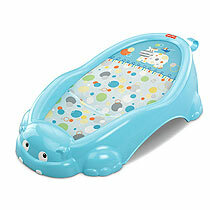 The Happy Bath Hippo makes baby's bath-time easy and fun for both baby and Mum. This colourful character-forward design has soft rounded sides to create a comfortable little sling for baby to rest in. The mesh fabric allows baby to sit in the warm water and it dries easily after use. This bath aid is ideal for newborns and should be used in a single-basin sink or bathtub. 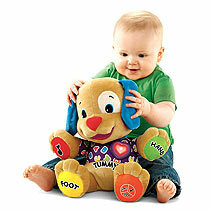 Cuddly friend brings fun to baby’s fingertips. 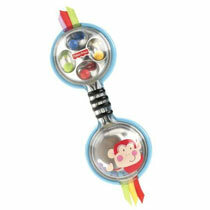 Press the monkey’s cheek for music, or enjoy teethable clackers! This lovely neutral baby changing mat features a Fisher Price Precious Planet design which includes colourful giraffes standing under palm trees with the wording ' Animals Big and Small, we must protect them all'. Sleek, crevice free and stain resistant seat pad. Smooth coated restraint straps are designed to simply be wiped down - no more tiny crevices for food to get stuck. The Fisher-Price Laugh & Learn love to play puppy has a multitude of learning activities and two interactive play modes, from learning A,B,C's and 1,2,3's to colours and body parts, it has musical fun and games with a light up heart that twinkles to the music. 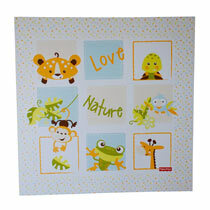 This delightful splash mat is ideal for messy babies! 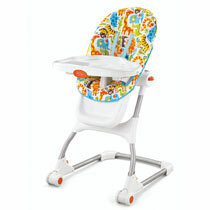 Simply place under the highchair and wipe clean any spills after feeding. 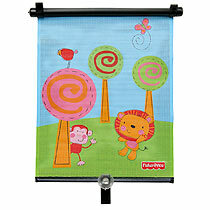 It can also be used under an easel for painting as baby grows into toddler years. 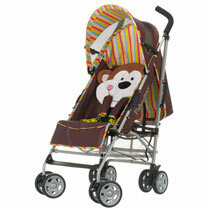 The Luv U Zoo Fisher Price branded stroller from Obaby is lightweight and practical for mums and dads, and designed with a cute cheeky monkey which kids will love. 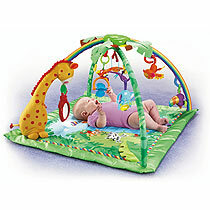 It features a multi position height and is suitable to use from birth in the lie back position. It has an adjustable 5 point harness and wipe clean fabric making it easy to look after and it is easy to lift and carry with lockable swivel wheels which makes this buggy pretty versatile too. 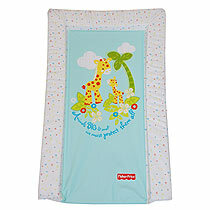 This colourful Fisher Price bathmat allows parents to be sure that the temperature of the baby’s bath water is safe. It is made from a soft and flexible anti-slip material so there is no chance of a child slipping on it when they enter the water. 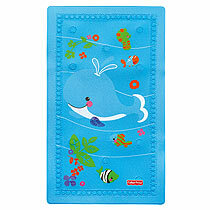 This bath mat is bright and fun with Precious Planet sea creatures that any child will love. 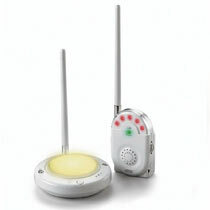 It is extremely functional with words ‘Too Hot’ appearing for parents peace of mind. A child's first lovable puppy. 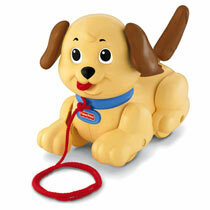 This pull along classic has lots of fun actions for little ones - he turns his head, wiggles his ears, wags his tail and barks as he is pulled along. Shiny leaves wave gently up and down while a smiling dragonfly plays peek-a-boo! 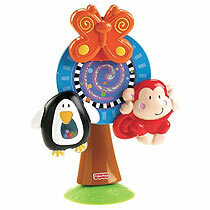 Other rainforest friends join in the fun, dancing and twirling as the mobile spins around. This brightly coloured sun roller blind is great for keeping children in the shade in the car and helps block the suns glare. 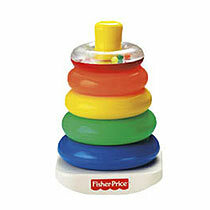 Kids will love the adorable Fisher Price design and parents will appreciate how easy they are to use when needed. This round "tree" features a suction-cup base that will affix easily on to any flat surface, such as a highchair tray. 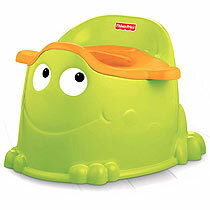 Potty training is much more fun with a froggy friend! 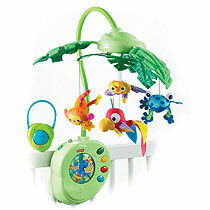 The adorable little green guy is easy for little ones to get on or off independently. 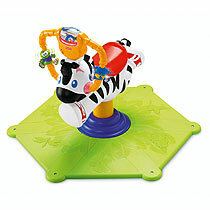 The bounce & spin zebra encourages your child's physical development while enhancing hand eye coordination, motor skills, balance and coordination. 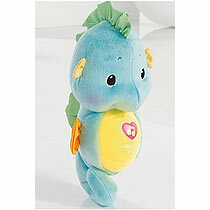 As this perfectly sized nightime friend is cuddled, his tummy gently glows and plays over 5 minutes of music and ocean sounds. 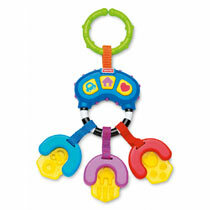 Three musical teether keys that come with music and fun sounds, bright colours and textures that encourage your baby to learn through play. These assorted rattles from Fisher Price include 4 different designs, including Discover 'n Grow Smiling Monkey Rattle, Waddle Clacker Penguin, Sweet Treats Lollipop and Peg Fish. 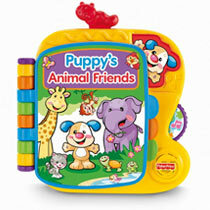 The Fisher-Price Laugh & Learn animal book helps your baby learn through everyday experiences, it introduces the concept of books and stories; it enhances language skills with sing-along songs and first words, all the while encouraging interaction & pretend play. 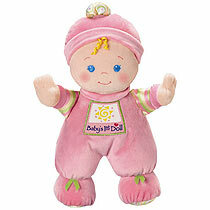 Fisher-Price My 1st baby is a soft plush baby doll that has an embroidered face, soft huggable body and features a rattle. 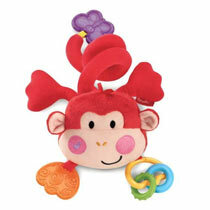 Fisher Price has become a brand much loved by parents all over the world. This is not only because their products are great but also because Fisher Price are extremely proactive in helping parents understand why their products are good for baby's development. Their recent marketing campaign to promote their Milestones campaign has been developed to highlight easily to parents the stages of development a baby reaches as they grow. The simple colour coded graphics make it easy for parents to choose the right product at the right time. In addition, they have also developed 'My baby's first year' calendar, which is a lovely little booklet for parents to record all the changes baby makes month by month alongside a guideline of the development stages they may expect in their baby's first year along with what Fisher Price products would be suitable to aid development at that time. babycity is giving one of each free with every order! Fisher-Price was founded in 1930, hardly the best time to launch a new business as the shadows of the Depression still loomed over American business. Still, Herman Fisher, Irving Price and Helen Schelle combined their diverse manufacturing and retailing experience to create their toy company and confidently brought 16 wooden toys to the International Toy Fair in New York City. The whimsical nature and magical surprises of those first toys quickly caught on and became the hallmarks of Fisher-Price ever since. 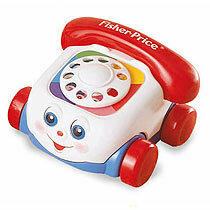 In 1969, at the age of 71, Herman Fisher retired as President of Fisher-Price. In November, 1993, stockholders of Fisher-Price, Inc. and Mattel, Inc. approved a merger under which Fisher-Price became a wholly owned subsidiary of Mattel. This merger ignited remarkable growth in the international markets and through product acquisitions. The Fisher-Price mission is to support today's families with young children through a breadth of products and services that make early childhood more fun and enriching. It's philosophy is to believe in the potential of children and in the importance of a supportive environment during the preschool years. Fisher-Price values include keeping with its long-standing tradition of innovation, quality, durability, safety and good value, they offer products and services consumers can trust to improve their family's lives. Through the teamwork, the brand challenges itself to strive for excellence and to exceed parents expectations.